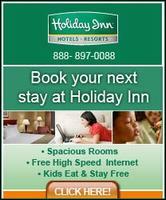 Stay Smart at the Holiday Inn Express & Suites Waukegan, located 30 miles from Chicago?? s O?? Hare International Airport (ORD) and 45 minutes from downtown Chicago with easy access to several major interstates. Imagine a 100% smoke free hotel near the north shore of Lake Michigan.This Chicago hotel is located in close proximity to Motorola, Cardinal Heath, Baxter Healthcare and Abbott Laboratories. Make a vacation out of your visit to the Great Lakes Naval Training Center located 5 minutes from the Holiday Inn Express & Suites.Just for fun, spend a day shopping at Gurnee Mills Outlet Mall or thrill seeking at Six Flags Great America and Hurricane Harbor. Explore the shores of Lake Michigan at the Waukegan Harbor & Marina, a short drive from the hotel. Your newest choice for a Gurnee hotel is close to all of the fun. No reviews were found for Holiday Inn Express-waukegan.